Abul Kalam Azad, an eminent journalist, has been appointed as the Managing Director and Chief Editor of Bangladesh Sangbad Sangstha (BSS) with the rank and status of a secretary to the government. He was appointed on February 3, 2014 for a three-year term, which was later extended to February, 2020. Prior to joining the country's only national news agency, Azad worked as the Prime Minister's Press Secretary from 2009 to January, 2014. Earlier, he served as the Press Minister at the Bangladesh Embassy in Washington D.C. Upon returning from Washington D.C. in 2002, he was made the Press Secretary of Awami League President and the then Leader of the Opposition in Parliament Sheikh Hasina. Azad made his debut as a journalist in the esteemed Bangla newspaper, the Daily Ittefaq, in 1973 and worked there for a long time when he was also active in upholding the professional excellence with dignity. He was the president, secretary general and treasurer of Bangladesh Federal Union of Journalists (BFUJ). 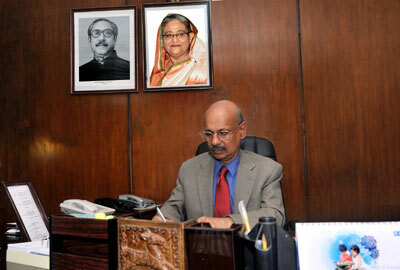 He also served as the president and general secretary of Dhaka Union of Journalists (DUJ). Azad was a member of the 5th Wage Board for journalists, employees and workers of the country's newspaper industry. Besides being a member of the Dhaka University Senate, he was a member of the Syndicate of Bangabandhu Sheikh Mujib Medical University (BSMMU), member of the board of directors of Press Institute of Bangladesh (PIB), Bangladesh Press Council and Bangladesh Film Censor Board. A former student of Dhaka University (DU), Azad obtained a diploma degree on "Advanced Journalism" from Moscow. Outside of the lecture halls, he was a member of the Central Executive Committee of Bangladesh Chhatra League (BCL), the student wing of Awami League. He was also the Dhaka Divisional Treasurer of the All-Party Chhatra Sangram Parishad during the 1969 mass upsurge. Azad is a member of the National Committee of Bangabandhu Parishad and the president of its Munshiganj district unit. He is also associated with many social and cultural organisations.